Allergies including asthma occur when triggers are breathed through the air, causing irritation, inflammation, and narrowing of the upper airway passages. Common triggers would include pollen, dust mites, molds, and pet dander. 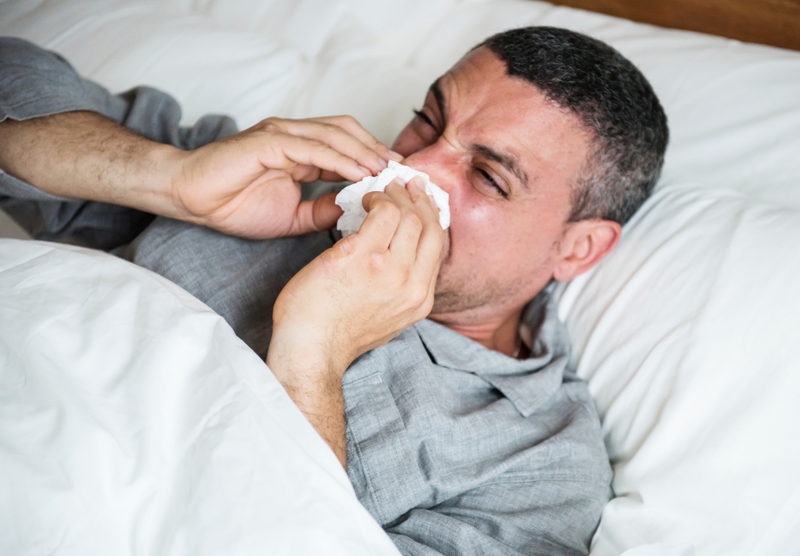 Common symptoms would include sneezing, runny nose, watery eyes, and nasal congestion. Furthermore, these can further cause poor sleep, sleepiness during daytime, and of course fatigue. Allergies may occur all throughout the year, though attacks are said to be more common during springtime. When it happens seasonally, it is commonly caused by airborne particles from grass, outdoor molds, trees, and ragweed. Snoring happens when the air is trying to flow through a blocked airway. It could be due to the retraction of the tongue root or inflammation of the airways caused by allergies. There is a vibration that initiates snoring. OSA or Obstructive Sleep Apnea is a disorder in which breathing is interrupted during sleep. It could happen briefly or repeatedly. OSA happens when the throat muscles relax and fail to keep the airway open during sleep. Patients with OSA are prone to develop chronic health issues like stroke and sexual dysfunction. When you experience an allergic reaction the lining in the membrane on your nose and or throat may become inflamed. Once this happens it creates an obstruction in your airways. Once the obstruction is present it can lead to snoring since the air that you are taking in does not pass through the airway easily. Sleep problems are common among patients with asthma and allergies. In a study done by Leger et. al, results showed that sleep is greatly impaired by asthma and allergy symptoms. The degree of impairment is directly proportional to the severity of the symptoms. Also, sleep problems are associated with fatigue and excessive sleepiness during the daytime. Productivity at school or work is also decreased. There is impaired learning, depression, immunity, and in general, a reduced quality of life. While allergies may not directly cause sleep apnea, there seems to be a connection. In one study published in the American Review of Respiratory Disease, results showed that patients with allergic rhinitis experience more frequent and longer episodes of OSA as compared to perfectly healthy people. If also shows that taking steps to control allergy attack and reactions have helped increase the quality of sleep. Controlling nasal congestion with the use of inhalers can help improve sleep and daytime fatigue. This was published in the Journal of Allergy and Clinical Immunology in 1998. You have to know though that other researches stop short of concluding that treating allergies can completely prevent sleep apnea. In a research published in the European Archives of Otorhinolaryngology, results showed that the use of nasal steroids can help improve the subjective quality of sleep for patients with mild OSA. However, such treatments are not enough for all patients. Asthma and Allergies are controllable. Since allergy symptoms can be irritating and may affect the overall quality of your life, it is very important for you to be aware of your triggers so you can start taking steps to ensure a good health. Take medications if necessary. These can greatly help in relieving your symptoms and improving the quality of sleep. For severe attacks and apneic episodes, consult a doctor immediately. Another factor that comes into play when discussing sleep apnea and allergies is CPAP therapy. CPAP, also known as Continuous Positive Airway Pressure works like a ventilator, providing mild air pressure continuously to keep the airways open among patients who cannot breathe on their own. Nasal congestion and other allergy symptoms cause the upper airways to narrow, hence increasing the risk of both snoring and OSA. The good news is that controlling nasal inflammation may also help reduce the symptoms of snoring, OSA, fatigue, and sleepiness as per one study conducted by Staevska et. al. 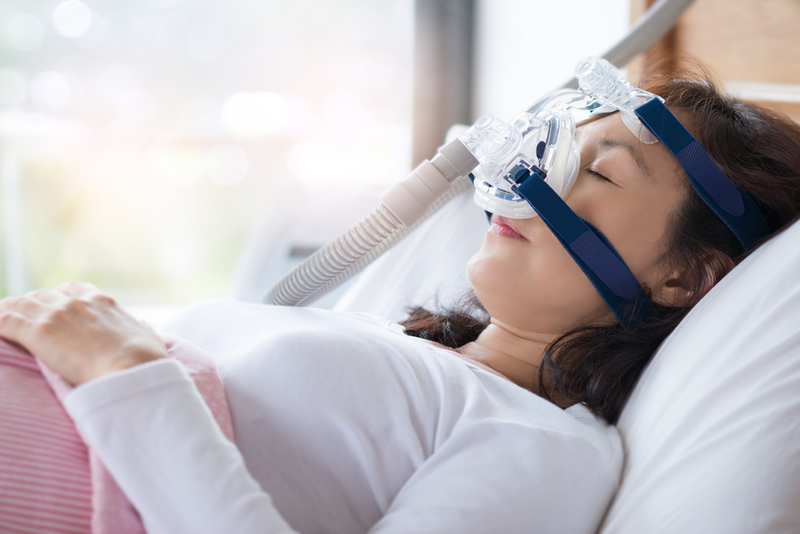 Allergic reactions can disrupt the CPAP therapy normally used to treat sleep apnea, hence manufacturers have taken the necessary steps to help people get around the issues caused by the presence of both allergies and apnea. For example, if your allergies make nasal breathing difficult, you are more likely to experience relief by using a full face mask because it also covers your mouth to ensure that you will get enough air even if your nose is congested. Also, advanced CPAP or Automatic Positive Airway Resistance (APAP) can help resolve breathing fluctuations caused by allergies. This technology can deliver different amounts of air as needed all throughout the night. You may consult your doctor about these possible solutions. You don’t have to suffer from allergies or asthma and sleep apnea. There are options available to you. You just have to know the cause of your snoring or apnea. Go and see a medical professional to help control your symptoms and suffering.